quick update : iGetwind is now showing 3 data for waves : wind swell, swell 1 and swell 2. I found it to be a lot more precise like that. Also for those of you in Europe, there is now Arome 1km model, it's a high resolution model from Meteo France. Really good forecast for short term. 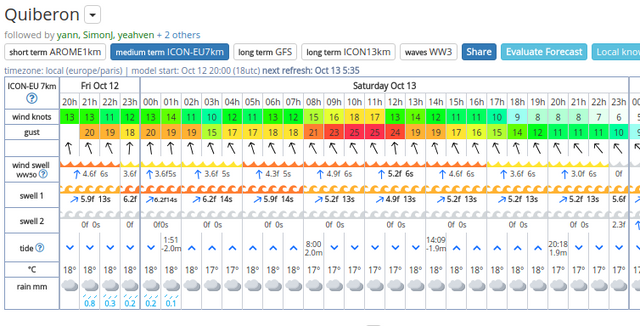 By the way you can click on the map on any coast worlwide to get wind/waves/tide forecasts. Igetwind is a wind/waves/tides web app I've built, you can add multiple forecasts on your page and compare different models. Give it a try you will love it ! Last edited by laf1greg on Sat Oct 13, 2018 2:58 pm, edited 1 time in total. Where is possible to get this app ? I didnt find in app store. It is a web app wich means it's in a web page. Go to https://igetwind.com and click on the map (or double tap on mobile) and you will get forecast on any location worlwide. now installed on all my devices. Yes, very nice presentation. Especially like having tide data present. Thanks alkiter and Foil. I'm really glad you like it!! I wish you some good wind ! Pretty sweet...with all the forecast apps, why are there so many forecast models and which one should we use? Thanks for your hard work. Thanks for your question beebad. Are you in Europe or in north America ? Usually you will get a good knowledge of a particular model after comparing what it says and what kind of wind you actually experienced at the beach. You could found that a particular model work better on some location. Also you can compare different models that are coming from different authorities (in north america you get NAM3km NOAA VS LAM canada weather agency, europe you will get AROME1km meteo france VS ICON-EU Germany weather agency). By comparing models you can validate better a particular forecast, if models don't agree then there is less chance prediction is good. Also in north america you have HRRR wich is updated hourly, I found it good to see if if a forecast is inflating or deflating by comparing the different updates. Fell free if you have other questions. North AmerikaTHANK YOU VERY MUCH!!! !